This is me walking through the garlic a few days ago. The German Extra Hardy is as tall as my hips now. And the scapes, aka "garlic curls" are a few inches long. They'll be ready to snap off in a few weeks. The other varieties are coming along nicely too. According to Farmer Shain, the majority of planting is done for the season. Most of the transplanting too. This is a major accomplishment and it means he is now available to move on to other projects and to help more with harvesting. However, he will continue with succession plantings of lettuces, peas and beans as the season goes on. A few weeks ago I was stopped at the post office by a neighbor. He wanted to know if we had our "garden all planted yet?" I said "No" and laughed at his choice of words ("garden"?). Then I tried to explain our method of planting some crops in succession, sewing smaller batches over and over again, spread out over a period of time. He asked "why"?. I told him it was to spread the harvest out over several weeks, even months if possible. "If we plant an entire crop at once, all the food will be ready at the same time and we'd never be able to pick it all." Then he laughed at me and said "Exactly". Apparently his idea of gardening is to plant everything at once, then relax a bit and wait for the harvest. When the food comes on, harvest, eat, and give away as much as possible and then be done with it. This whole notion of spreading the food out over a longer period of time is not his idea of a good time. I think he even used the phrase "dragging it out so long". Well folks, we are in no hurry to get this farm planted and done with already. Shain is quite detailed, specific and careful with his planting schedule. It's too bad the weather and bugs have to be a factor in how well the crops grow. Still, you can be assured we are doing our very best to drag this season and the produce out as long as possible. We hop you all have a great 4th of July Weekend. We are having some family up for a few days. Our daughter Megan is performing with her school's bluegrass band. Then there's the rodeo to attend with all the younger city-boy cousins. I'm looking forward to it. Next week we start our intensified work schedule with harvesting food to sell at the Jackson Hole Farmers Market. We really enjoy the market. It's so rewarding to SEE the people who eat the food we are growing. And I admit to being quite fond of all the praise and compliments. But if we seem a little dazed over the next few months, you'll know why. Take Care and Enjoy your Veggies! I was fortunate to experience a beautiful full rainbow shining over EverGreen Farm this past week. It was so close and the colors were so vivid. Is it telling us the rain is over? This week you are getting several new items in your share, including some Asian greens called Chinese cabbage and pac choi. Soon after we transplanted our first batch of these plants they were attacked by flea beetles. The leaves looked awful and the plants were bolting before they were large enough to harvest. So the rows were tilled under and we will plant the area with another crop. The second batch of Chinese cabbage and pac choi did a little better, at least they weren't eaten completely by the bugs. However, once again the plants are bolting before growing to their optimal size. The Chinese cabbage is a real disappointment. Instead of growing large frilly leaves, the plants produced a stalk up the center and small leaves growing from the stalk. We decided to go ahead and cut down the entire row because the plants would only get worse in this week of sun we'll be having. Your bag of Chinese cabbage doesn't look so great, but it's all we'll be able to give you this year. You are also getting a bag of pac choi this week. Unfortunately this crop is also bolting, though not as bad. We harvested all the plants that had to be cut and it looks like there will be enough to give you one more bag just like it next week. Our family's favorite recipe for using up the Asian greens is to make egg rolls. We have a recipe here on the website, but I don't follow the ingredient list too specifically anymore. I use lots of substitute ingredients, whatever we have on hand. Egg roll mixture freezes very well. It is one of our winter time staples. Looks like we'll have a few days to dry out from all the rain that has been pouring down on us the past two weeks. I like rain, but sometimes it causes problems for us. First, the ground gets too soaked for Shain to get his planting done on schedule. Second, on some rainy days it's nearly impossible to work outside so we get behind on farm projects. Third, weeds. We'll be weeding now like crazy because of all this moisture. Good thing my dad gave us a Weed Wacker for Christmas last year. It's not an ideal way to deal with weeds, but there is no way all this weeding could ever be done by hand. Another new tool my dad gave us is a propane torch/weed burner. (Insert manly "tool loving" laugh here. Arh har har har.) My dad gives the best presents. Unfortunately there is not a tool to do the weeding when it's mixed right in with the vegetables. Back to hands and knees. The garlic is growing very well. I'm looking forward to the garlic scapes that will be coming on soon. It's been 2 weeks of crazy scheduling for our family with short trips to Utah, daughter at music camp, school certification conference, family reunions and rain. The kids have forgotten what it's like to do chores. (Not for long.) Whew. But we are back now and ready to harvest all the new crops that are just about ready. Next week? Kale! Have a good week and enjoy your veggies. Yep, it's the last of the turnips. When we went out to harvest them this morning, I noticed some kind of bugs have started enjoying them too. So we harvested all that was left to give you one last big bunch. Overall, we are very pleased with the Japanese turnip crop this year. The harvests have been much better than any year before. Apparently the trick is growing them early in the greenhouse. Shain tells me he thinks the spinach will be ready to start picking next week. Yeah! If a picture is worth a thousand words, what is this one saying? Wet. Rain. Mud. Love. Cold. Together. Smiles. Boots. Happy. Work. Muck. Crawling on Hands and Knees. Dirty. Persist. Carry On. Drenched. Soaked. Affection. No Make up. Goofy. Clean. Hand Crafted. Outside. Laugh. It has rained a lot this past week. (As if YOU didn't know.) For some crops, the rain and mild temperatures have been ideal for growing. However, the muddy fields have made it impossible for Shain to keep up with his planting schedule. Win some. Lose some. I'm also thinking about the abundance of weeds that will come as a result of this extra moisture. Humphf!! 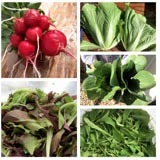 This week's salad mix is the first cut off our first out side planting. It's just about perfect. Enjoy! I'm sorry to say that this week's newsletter will be very short and void of photographs. But I do have some new recipes to share with you. 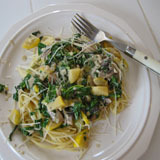 Two CSA members sent me recipes last week. They sound yummy. One is for a Bacon and Arugula Quiche, but I think it would also work well with the turnip greens you are still getting. Then next is Turnip and Cauliflower Puree. I'm going to make this one for sure. I harvested a new variety of radish this week. They are called Shunkyo Semi-Long, "a distinctive specialty radish from North China". Aren't they beautiful? Shain picked this variety because they are described as "slow bolting". And so far, so good. Even in the heat of the greenhouse. I hope these last a few weeks longer because they are a joy to harvest. They look like little carrots, and the color is incredible. We have some new additions to EverGreen Farm! About 2 weeks ago Daisy, one of our Saanen dairy goats, had her kids. Triplets! Then just a few days later our oldest doe Trinidy had her twin babies. (Sorry, no pictures to show of the second batch of babies. Isn't that typical? Mom takes lots of pictures of the first born, but not the kids that follow.) All goat mamas and kids are doing well to my great relief. The kids are eating well, and running and jumping around. It has been so much fun to watch. What is it with baby farm animals? Tell me! Are these piglets not the cutest little things you've ever seen? These four little guys came to the farm just yesterday. They have a big job to do and will enjoy every minute of their lives on our farm. I don't think there are many pigs that eat better than the pigs at EverGreen Farm. They have a new job description: Expert Compost Maker. My son Eli was very excited about the arrival of the piggies. As soon as he saw them he said "Hey guys! We are going to have a lot of fun together this summer!" A lot of work has been accomplished on the farm in the past 2 weeks. In the evening on Friday, May 22nd Shain decided to start planting the potatoes. (Some Friday night fun. We are strange.) It was a nice evening, not too hot. I thought we'd get one row planted, maybe two. Shain made the potato furrows with his walking tractor and then we started placing the potato seed down the rows one at a time, spaced approximately 1 1/2 feet apart. Then a few workers came to help and we started raking dirt up over the potatoes to create long mounded rows for hundreds of potato plants. Raking is the hard part. This job requires A LOT of raking! Did I mention we plant potatoes by hand? Then a miracle happened here on EverGreen Farm. Because within a few hours all 400 pounds of potato seed were in the ground and covered with dirt! That's 1,800 row feet of potatoes. This year's potato planting was by far the easiest we have ever experienced. I was amazed! Shain says that this was due to the soil being "just right". It also helped to have some incredible help. Pictured above is Clark, husband to Nicole, one of our workshares. He will now be affectionately referred to as Superman. This man can RAKE! Flea beetles also like Chinese Cabbage. These starts were transplanted out into field #1 a few weeks ago and they have been hit hard, despite Shain's efforts of crop rotation, spraying with insecticidal soap and using row covers. This can be discouraging. But from every "failure" we learn something. We know this farm has a problem with flea beetles and we even know what crops they love to eat (mostly the brassicas). We can either give up growing all these wonderful crops ("NO"), keep trying to fight against or out trick the bugs (not really working), or we can learn to work better with mother nature to avoid the flea beetle problems all together. Shain has been taking detailed notes and he has some good ideas for next year. We are thinking that new greenhouse will be put to use quite well next spring. We do have a second planting of Chinese cabbage that haven't been attacked yet, so I'm still hoping for a harvest. We'll see. So, what ya been making? Any good recipes? I always love a good early summer salad, especially with strawberries, carmelized onions and a nice vinaigrette. Simple and delicious. Shain made some incredibly tasty stuffed mushrooms last week with our turnip greens, sun-dried tomatoes, onions and Parmesan cheese. Today on my drive home from delivering the CSA shares, my mind was running wild with all my typical worries about money, children, home, farm, etc. As I came up over a small ridge I noticed the sun shinning down through a break in the clouds. It's rays turned the scenery into magic. Fields of dandelions were transformed into a blanket of gold. I saw lush green pastures dotted once again with cows, baby lambs and teenagers changing pipe. Homes of friends, neighbors and long time Star Valley residents sparkled from the drops of a recently passed cloud burst. I was overcome with joy and quickly my troubles turned to feelings of contentment, belonging, and peace. I love living here.